Coming Soon – A great Chanukah gift! Let’s see… Aleph… Hey… Gimmel… uh, no, that’s not right. The Gimmel comes before the Hey and after the Aleph. Or is it the Aleph comes before the Gimmel, but farther away from the Hey? 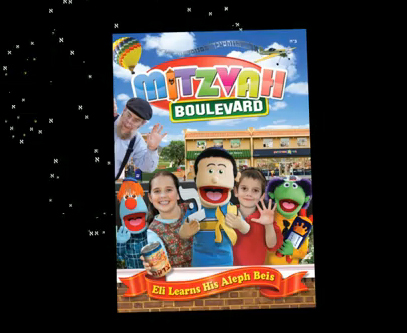 Eli can’t remember all the letters of the Aleph Beis in order; that is, until he gets help from his friends on Mitzvah Blvd. Join Eli and his friends as they learn the entire Aleph Beis one by one, but will they be ready in time for the big Aleph Beis contest? Mitzvah Blvd. Vol.1 is the first in a series of learning and entertainment DVDs. Each DVD is packed with Torah and teaches Jewish values in a way that kids from 1 to 120 will understand! It is expected in Crown Heights Judaica stores this Chanukah.